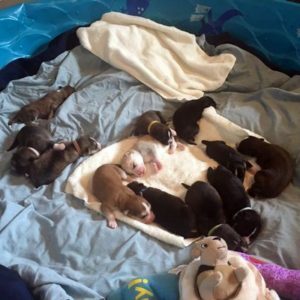 Recently, we had puppies born in our care. I’d like to introduce you to Lemmy and the Darling Dozen. Lemmy (and her very concerned owner) were taken advantage of leaving poor Lemmy with a litter of puppies to care for. Since she is not quite a year old herself, Lemmy is struggling with keeping all twelve of her babies fed and herself healthy. Her fantastic foster mom has been supplementing Lemmy’s feedings with bottle feeding to ensure that each baby gets enough to eat. Lemmy has to be careful too, her iron levels are seriously low and she’s way below an appropriate weight. To help cover the costs of the goat’s milk replacement formula we are using, we are auctioning off the naming rights to most of the babies. This is a GREAT way to honor a lost pet or family member. Official rules: Bidding starts now and will end Sunday, April 9th at exactly 11:59 PM EST. Winning bidder will have until Sunday, April 16th at 11:59 PM EST to submit their payment and selected name via Paypal to info@tararescue.org. Inappropriate, vulgar, or otherwise offensive names will be ignored. Winning bidders will receive a message informing them of the win and up to two follow up message with payment information. In the case of a nonpaid bid, the second highest bidder will be notified on Monday, April 17th of their option to claim the naming rights. Questions? Send an email to: info@tararescue.org. Baby #2 – A Boy! Baby #3 – A Girl! Baby #4 – A Boy! Baby #5 – A Boy! Baby #6 – A Boy! Baby #8 – A Boy! Baby #9 – A Boy! Baby #12 – A Girl! Baby #13 – A Boy! The babies are Houndsky Pits (half husky, and half pitbull and hound) and will be ready for adoption when they are 8 weeks old. Lemmy will be cared for by our foster network and returned to her owner when he returns from deployment. I am Tyler, and i am Lemmy’s owner. It is truely a blessing to see so many people help and care so much about my dog when most haven’t even met her. This whole situation has absolutely broken my heart for her, as this wouldn’t have ever happened if i wasn’t overseas for this entire year. None of this should have ever happened, but with the situation i was left with in my last week in NC, i had no choice and put my trust into someone i thought would take good care of her. To everyone who has helped her and her babies, from the bottom of my heart, thank you so very much. There is no way she would’ve been able to pull out of this horrible situation without each and everyonr of you. I am truely in debt to you all. Last PostSummer Safety Series – Basic TipsNext PostRed – Adopted!